How to Make Perfect Mashed Potatoes: Step by step instructions and troubleshooting for making fluffy, creamy mashed potatoes. Includes steps on how to freeze mashed potatoes. I don’t know about you, but the holidays would not be complete without mashed potatoes! I can’t imagine eating a turkey dinner or my mom’s meatloaf without a big scoop of fluffy potatoes on my plate. But if the mashed potatoes aren’t light and fluffy, forget it! I don’t want them. 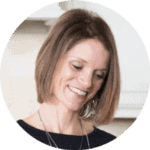 Let me walk you step-by-step through the process to the perfect mashed potatoes, that will be the perfect side to your family meals. The best method for mashed potatoes is to make them with baked potatoes. When you boil peeled, and chunked potatoes, the potatoes will absorb water as they cook. If you roast potatoes instead, you are left with noting but pure potato flavor, instead of watered down potatoes. Start with Russet Potatoes, that have been scrubbed well and dried. Place on baking sheet and pierce with a fork 3-4 times each. 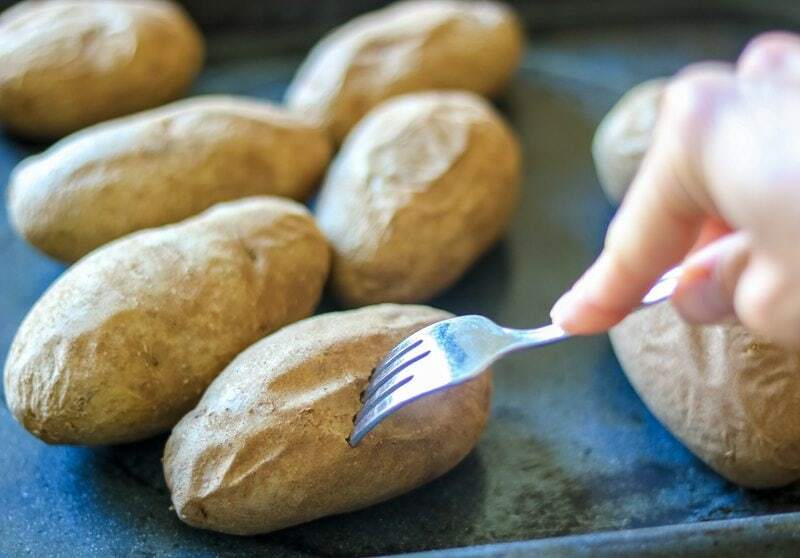 Roast potatoes until fork tender. Alternatively, you can speed things up by making baked potatoes in the Instant Pot instead of in the oven. 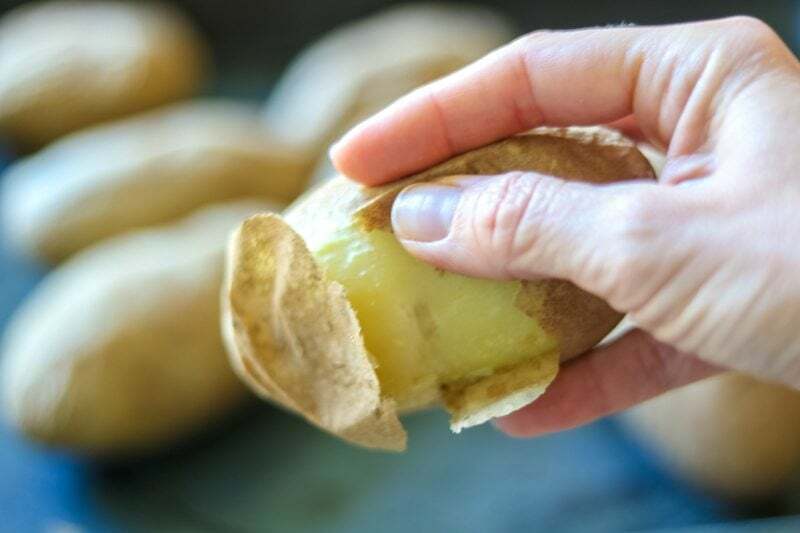 Once cool enough to handle, peel the potatoes with your fingers or a knife. This is so much easier than peeling raw potatoes. 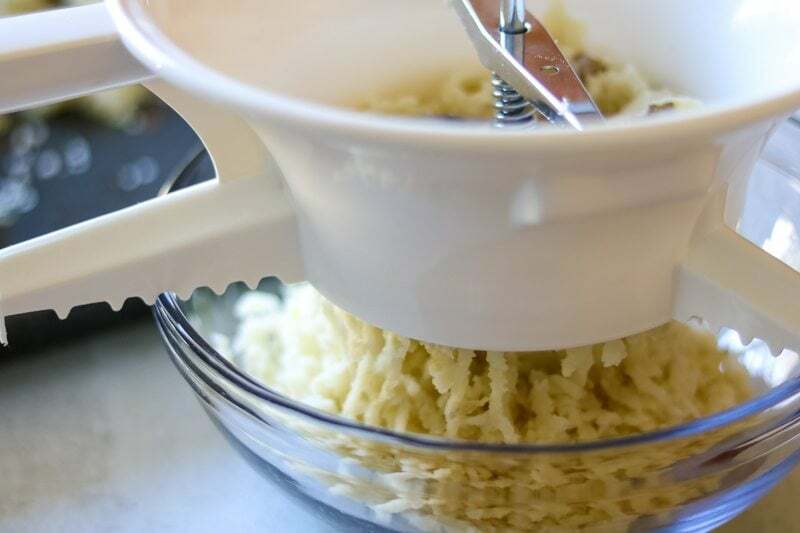 In my opinion, if you want creamy mashed potatoes, there is only ONE way to achieve this–with a food mill or ricer. Place chunks of potatoes into a ricer or food mill and process. After the potatoes have been riced, add warm liquid to the potatoes and mix until the liquid is just absorbed. For extra creamy mashed potatoes, add in a generous scoop of sour cream. This is my favorite addition to mashed potatoes. Why should you add warm liquid to the potatoes?It helps the cream and butter or whatever liquid you are using to be better absorbed by the potato and also will keep your mashed potatoes warm. Place into a large pan and cover with water. Bring to a boil and then boil until fork tender. Drain the potatoes and return to the heat, until all the moisture has evaporated–about 1-2 minutes. You can also boil the potatoes whole with skins on. Boil until tender and let cool slightly before peeling and mashing. How many times do you wish you could make your mashed potatoes days before a holiday event? I can’t tell you how many times I remember waiting on a Holiday meal for my family to finish making the mashed potatoes. When making mashed potatoes in advance, it is best to increase the moisture slightly to the potatoes you add to the potatoes. As the potatoes rest they will absorb extra moisture. By planning for that and increasing moisture in recipe (ie. more cream and butter), you will still be left with creamy mashed potatoes. Tip: you can also just add warm cream or milk at right before serving if needed. There is nothing better in my opinion at the holidays then getting a jump start on holiday dishes and freezing them a few weeks or a month in advance. To freeze mashed potatoes, make as directed and let cool. Freeze in individual servings, by scooping onto a parchment lined cookie sheet. Freeze solid and then transfer to a freezer safe bag for up to 3 months. Place the mashed potatoes into a freezer safe bag and freeze for up to 3 months. For individual servings: place as many as frozen desired servings onto a greased baking sheet and heat at 350 degrees for about 30 minutes or until cooked through. Stove-top: Place desired amount of thaw potatoes into a saucepan and heat over medium-low heat, adding in milk or stock as needed. Oven: Place desired amount of thaw potatoes in a greased casserole dish. Cover with foil and bake at 350 degrees for 25-35 minutes, or until warmed through. Stir once half-way through. If potatoes appear to dry out, dot with butter or stir in a splash of warm milk, stock, or cream. If potatoes are frozen, increase cooking time by 30 minutes and stir an additional 2 times. Slow-Cooker: Place thawed potatoes into your slow cooker and cook on low for 2 hours or until warmed through. If potatoes are frozen, increase time to 3 hours and check potatoes. You may need up to 4 hours to fully reheat frozen mashed potatoes. Tip: I plan on 4 hours and if ready at 3 hours, I turn slow cooker to keep warm! Which potatoes are best for mashed potatoes? For creamy, fluffy mashed potatoes, you want to choose a starchy potato like Russet or Yukon. Red and white potato varieties are waxier and therefore best used for smashed or roasted potatoes. How much Mashed Potatoes should you make? As a side dish, you should plan on 1/2 pound of potatoes per person. That means if you are planning on 10 people, use 5 pounds of potatoes. 4 people, use 2 pounds of potatoes. I make my mashed potatoes with a few “secret” ingredients that are perfect things to use to cut back on fat and calories in mashed potatoes without sacrificing on taste or texture. 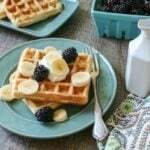 Use evaporated milk instead of milk or cream. It will add richness to your mashed potatoes but be lower in fat. Even skimmed evaporated milk works. You can replace half the milk/cream in mashed potatoes by using chicken stock or vegetable stock. Portion Control: Fill your plate with vegetable sides like Roasted Green Beans and limit yourself to one serving of mashed potatoes–and savor every bite. For 3 years, I was dairy-free. So I have found a perfect way to create creamy, tasty dairy-free mashed potatoes. And it is SIMPLE! Instead of cream or milk, use vegetable or chicken stock–I like the flavor of the stock much more than non-dairy milk in potatoes. Why are my Mashed Potatoes gummy? Chances are you overworked the potatoes–either by blending, making in a food processor, or over beating. 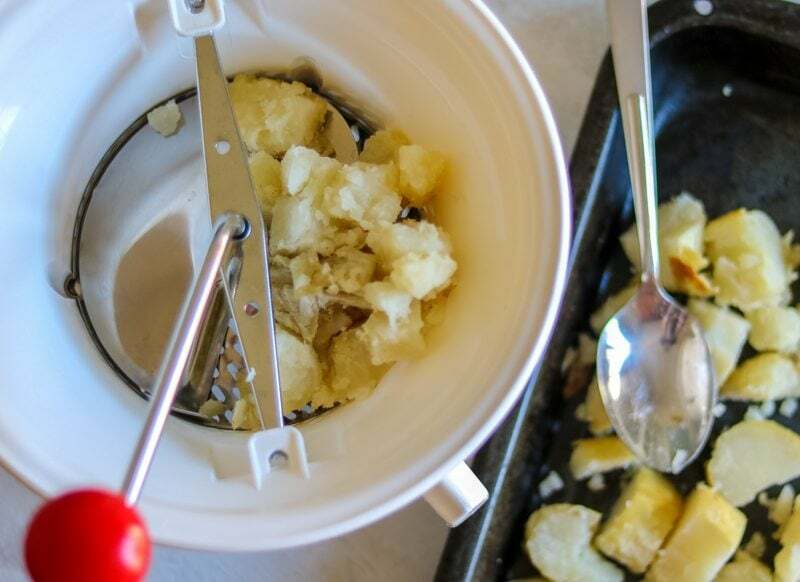 To PREVENT gummy mashed potatoes, use a food mill or ricer to process the potatoes into the perfect texture to absorb the flavoring and moisture you add. Nothing is worse than biting into a lump when eating “creamy” mashed potatoes! Avoid lumps in your potatoes by using a food mill or ricer. This will ensure the perfect texture to mashed potatoes without over processing the potatoes–which like I stated, leads to gummy mashed potatoes. Have you ever found yourself with way too many potatoes? I sure have. My number one recipe for leftover mashed potatoes is Pierogi Lasagna. How to make fluffy, creamy mashed potatoes. Pierce potatoes 3 times and place on baking sheet. Bake potatoes until fork tender--about 40 minutes. Once potatoes are cooked, cool until just able to handle. Peel off skin with knife or fingers. Run potatoes through food mill or ricer. Heat up the milk, butter and salt together. Slowly add to potatoes and mix until absorbed. Stir in the sour cream if using and serve. Hi Amy!! Aren’t ricers the BEST?!! 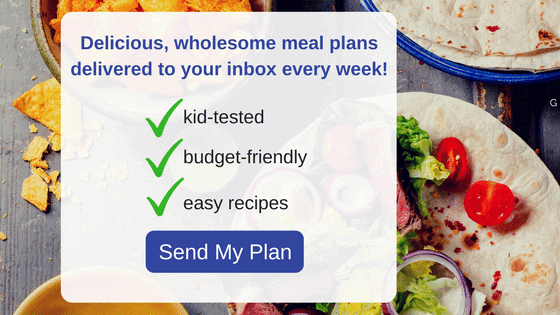 And so glad you appreciate all the alternatives–I really want my recipes to be valuable to all dietary restrictions. Hope you are well! We miss you guys!